Yes...I did not remember anything. Hi all. I am so far behind here. Skipped ahead about 10 pages. To back from Florida last night. What have I missed? I saw that Lumpy needs some prayers... coming your way 4donks..
Hi Cookie, hope Florida was great. Stay warm. Me getting a dog Cookie. A shepherd from Alabama -- from a shelter. I am thrilled! They think she is between 2-3 years old. She weighs about 70 lbs. I have named her Belle after the southern Belle because she is coming from Alabama. A friend of a friend found her for me -- she came in as a stray at the shelter in Athens. Folks are volunteering to drive different legs of the long trip. I should have her on Sunday, March 10th. It would be sooner, but because she is crossing state lines, she must be quarintined for 10 days. I am so excited -- it is time. Klaas' husband suggested Baby Cakes for her name -- so very cute. But I think I will stick with Belle. I can't wait for you to get her Sister!!! So kind of the volunteers to drive her up to you. This is the name of the volunteer group doing the transport of Belle. There are so many animal transport groups that do a wonderful job of getting dogs to their new owners. So blessed you found them Sister. Lumps is still in the sling and unable to stand alone. I bought an engine lift with a spreader bar and it works well and if he goes down I can use the lift to get him back up without having to wait for others to come help me. Beside all the other things he's getting..I have to draw up 50cc's of Peptobismo and give it to him 4 X a day (nothing like pink drool) if this doesn't slow down his diarrhea by tomorrow they will try a more aggressive drug but that can cause him to lose his appetite. The vet thinks he can get Lumps back to his old self but it will take time and if he loses his quality of life he will have to be put down. Prayers still needed. I've parked the SUV in the barn and have been spending the nights up there . The other donks think it's treat time and bray constantly and then the dogs start barking and I bet this makes me a really popular neighbour. 4D, you and Lumpy are in our prayers here. Today is the 21st birthday of a friend's child. Jack died when he was 3, the Dad, Frank has been an immense help with easing me through my brother's death. Please keep this family in your prayers. He has done a marvelous job of keeping his son's memory alive. Prayers for your friend and I am very thankful he is helping you through your brother's death. I hate to change out of my Valentine's Day clothes. Every day should be Valentine's Day! Every day should be Valentine's Day. You are so talented Brandi. Bearly, when Belle comes, it will be a wonderful valentine for me! I can't wait til you get her Sister, please post loads of pictures on Sunday. Just checking in. It's cold here in Alabama. Lumpy crossed the Rainbow Bridge at 11:00 this morning. The vet was here to euthanize him and he just went over the bridge without assistance. Thanks for all your thoughts and prayers. I'm so sorry 4 Donks. You are in my prayers as are the donks and pups. Oh, 4 Donks. I am so sorry. You gave him a very happy life. I remember when you bought a pickup full of watermelons for the donks. You and Lumpy made each others' lives happier. I am not changing my clothes until the Belle of the Ball comes to the party. She can be our homecoming queen. A new baby in the family! Congratulations Mama Sister or Sister Mama and Congratulations Belle, you could not have chosen a better Mommy! This poor little guy perished in a car fire with his Mom in the April following the Christmas they made this tape. So sad. I remember that little video. I had no clue the little boy perished in a fire. Poor kid he is so cute. I am so very sorry, 4D. I had this feeling in the pit of my stomach that Lumpy was going to be our angel Donk. At the time he passed, I was at a funeral mass for a Sister friend of mine. I am deeply saddened by your loss as Lumpy and his stories have touched my heart since you brought him into our lives. My heart is truly broken for you. 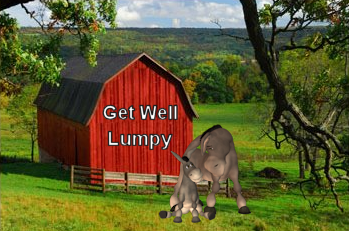 I want to convey my deepest sympathy to all who love and care about Lumpy. Do you have pictures of him being our Lumpster during his time with you? I would love it if you could share them with us. I hope you are comforted by the many memories Lumpy leaves you with and know, of course, he is waiting for you. He is able to join the other animals you have been kind to over time. I wish I could be there to help you. I am glad you have your Sisters so close. I don't know what you mean by 'he went over the bridge without assistance.' Did it mean he passed on his own without the anesthesia? Again, my condolences to you, the 3 Donks and the fur babies. Bearly, you always have the most comforting words. 4 Donks, Lumpy is running through the fields in heaven and Josef is nipping at his heels. May he rest in peace. My prayers are with you. Tomorrow I have to go to the funeral of a friend, who I have know for many years through the Sisters, she is also an Associate like me. She retired from being their secretary several years ago. She bravely fought cancer and was in hospice with stage IV cancer for 1 1/2 years. She fought like a woman. 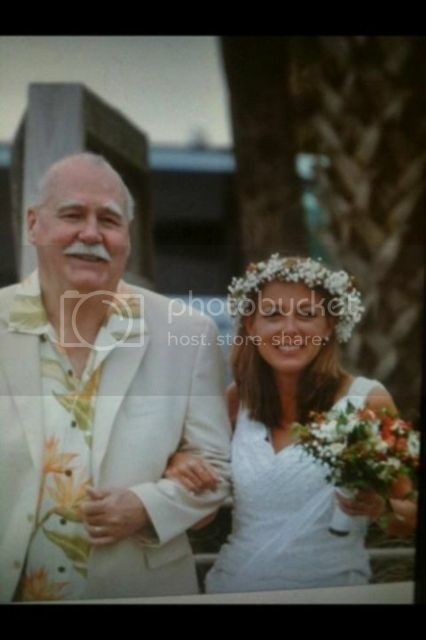 Please keep her and her loving husband and family in your thoughts and prayers. Tomorrow is also the funeral of a resident where my parents live, she lived there many years in the apartments and only very recently was transferred to hospice. Please keep her in your thoughts and prayers. This has been a tough week. One memorial service of a beautiful man who was a loving husband, college professor, and musician, and three funerals. One was today, she was a Sister, who in addition to going on many missions, also started the gift shop by making crafts and selling them long ago, it has grown into quite a lovely place. Also, my friend since grade school's son would have been 21 yesterday, he was 3 when he passed away. His Dad has been a tremendous help easing me through my Brother's death this summer. My Son's Speech Therapist's cousin (therapist is her POA and only living relative, so it is closer than it sounds, has been his therapist of 17 years--lost her parents, one last year and one the year before (my son was pall bearer), she has no siblings, was never married and has no children) has decided to forgo chemo and go into hospice. She will leave behind 4 cats who will be tough to place. I don't think it will be long. Please pray for his therapist so she can help her cousin through this tough time. Today, Lumpy passed. Such a sad sad week. You are all in my prayers. So sorry Bearly for all your losses. Praying for all your friends you have lost and for your son's speech therapists cousin. So very sad. Brandi once again your artwork has brightened my day. Yesterday the only thing holding him up was the sling..his legs just buckled so we lowered him so that he was laying down on his horse blanket with his head in my lap and called the vet. He was laying beside the coralling and the other donks wouldn't leave him and kept putting their snouts through the the coralling to touch him. The vet arrived and was drawing up the med to put him down when suddenly the other 3 donks walked away...he was gone . We buried him on the hill overlooking the barn and the donks' pasture. My sister thinks we need to plant an apple tree to mark his place...he loved apples. The other donks have been unsettled and braying a lot. The vet thinks this is normal but it is so sad. Lumps overcame so many things.lost 250-300 lbs after treatment for his Cushings,he was badly foundered when rescued but overcame everthing and you kind of assume he could overcome anything that was thrown at him. Once again thankyou for your prayers. 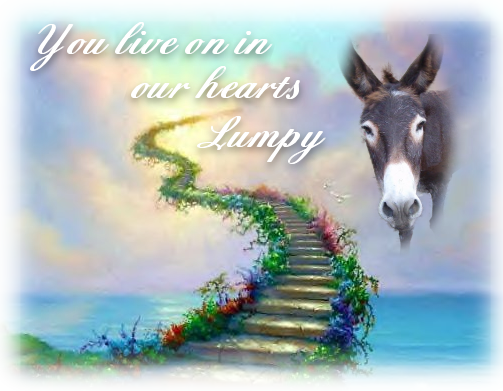 Lumpy was so lucky to have you 4 Donks. You gave him a great life. I can only imagine how the donks feel missing their friend. I think an apple tree would be a wonderful thing to plant in honor of him. Your sister had a very good idea. Praying for you all.